This cartoon is a classic. We have been using it in our parent and teacher training workshops for several years now. We know that it does not have to be this way. Research has shown that when children have challenging behavior, appropriate assessment and intervention will work to decrease the behavior. If you are the parent in the picture above, ask your child’s teacher to get help from a Board Certified Behavior Analyst (BCBA or BCaBA). The behavior analyst will complete a functional behavioral assessment (FBA). The behavior analyst will work collaboratively with the parents, teacher, related service personnel, and possibly even the child (depending on age) to develop a behavior intervention plan (BIP) to address the behavior. The behavior analyst will help train everyone to implement the plan. Finally, the behavior analyst will assist in developing a data collection plan to monitor progress. If you are the teacher in the picture above, contact your school’s behavior analyst to get help with the FBA and BIP. It will make your life so much easier in the long run. 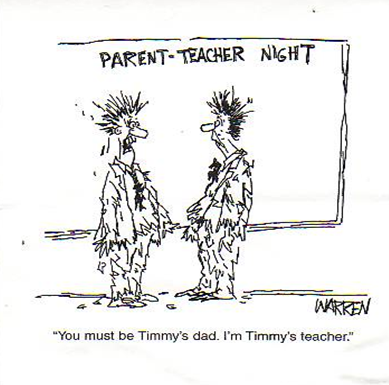 Have you ever felt this way at one of your parent teacher conference meetings? Has your child had an FBA and BIP? Please share!